Honoring the alumnus for whom it is named, the first Bruce Stangle Award for Distinguished Service now belongs to Bruce Stangle ’70. A longtime Bates trustee who retired from the board in May, Stangle received the new Alumni Association award during the spring trustees meeting, this year held in conjunction with the Volunteer Leadership Summit. 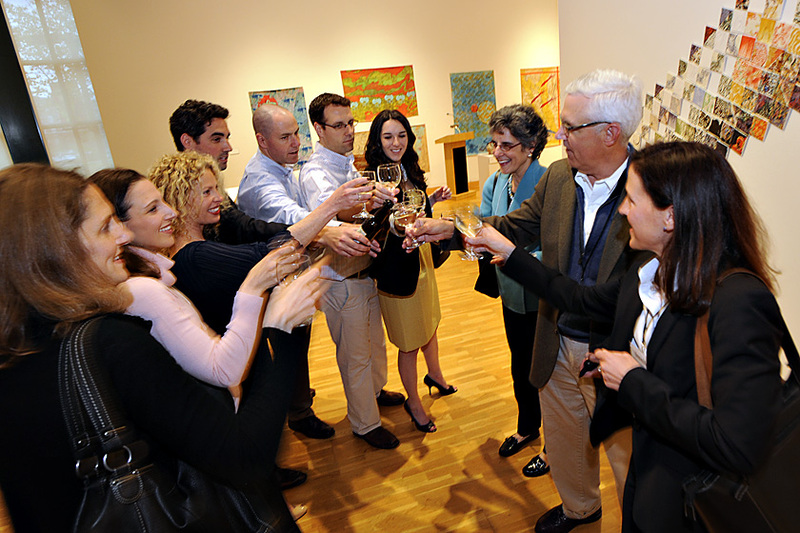 Family and friends toast Bruce Stangle '70 (second from right) and Emily Siegel Stangle '72 (third from right) on the occasion of Bruce being the first to receive an award honoring him: the Bruce Stangle Award for Distinguished Service to the Bates Community. Photograph by Jose Leiva. The Stangle Award will annually recognize outstanding contributions to Bates career development — exactly what Bruce Stangle has provided for more than a generation. Indeed, since co-founding the Boston-based consulting firm Analysis Group Inc. in 1981, Stangle has been personally and professionally committed to the success of Bates graduates. Analysis Group has recruited many young alumni into the firm through the years and, in partnership with the Bates Career Development Center, has sponsored countless Bates student interns. Stangle himself has hosted or spoken at many Bates career-related events. A 14-year Bates trustee, Stangle is considered a valuable, engaged liaison between Bates and the business community. “Bruce is a truth-teller who provides crucial feedback to Bates about how our students are faring,” says Trustee Jennifer Guckel Porter ’88. This cycle of feedback helps students and alumni while raising the value proposition of business, consulting and finance careers at Bates, says Porter, a managing partner for The Boda Group, a Boston-based leadership development firm. Jennifer Guckel Porter '88 laughs with Bruce Stangle '70 at the Museum of Art reception honoring Stangle. He is the inaugural recipient of a new annual alumni award named in his honor: the Bruce Stangle Award for Distinguished Service to the Bates Community. Photograph by Jose Leiva. 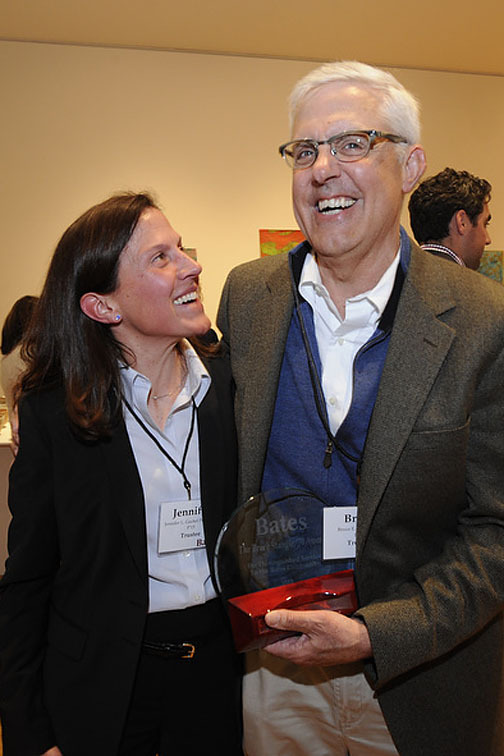 In 2003, Stangle was the driving force behind the creation of the Boston Bates Business Network, formed to bridge a gap in Bates’ on-the-ground efforts to support alumni in their career trajectories. The Bates Regional Networks, since extended to a number of U.S. cities, offer dynamic programming while helping participants meet, connect and learn from one another on a personal and professional level. Porter, a beneficiary of Stangle’s “incredible generosity and wisdom” in her own career, says her mentor always makes time when it comes to guiding Bates students and young alumni. “When people want his help, he meets with them, takes their phone calls and steers them in the right direction,” she says. He’s an equal opportunity mentor, too. “It doesn’t matter if the person is an uncertain current student who sends him an email, a mid-career acquaintance considering a career shift or an entrepreneur with a new idea,” Porter says. Stangle is married to Emily Siegel Stangle ’72, and their daughter Alissa Stangle O’Shaughnessy is a member of the Class of 1996. As a major Bates philanthropic contributor, his and Emily’s gifts include funding of the Stangle Family Fund for faculty and student research in economics and law; the Betty Doran Stangle Professorship in Applied Economics, named for his mother; and the Frank Stangle Lounge in the 280 College St. Residence, named for his father.